FYI, for those asking why I found their reply so inadequate. My contact at Weller who passed on the question to higher up came back to me to assure me they weren't fobbing me off and they were busy working on a formal response, so it was kinda like the response was hyped up, and then I got the lackluster Dear Sir response. I firmly believe this is a manufacturing (lost in translation) mistake, but they don't want to admit it. But, still think there should be a thermal fuse in the transformer. Everything else which uses a linear power supply seems to have one, certainly in 220~240v land. But this (lack of primary fuse) was done on two different models, bot bottom end units. Seems like a very deliberate choice. Especially when (I would expect) they would have had pre-production units, engineering samples and a few prototypes to have reviewed before manufacture began. There's no way in hell the manufactured unit should have had a "surprise" like a missing mains fuse. It would have been a very deliberate decision to build them as they are. If the current is higher than the fuse rating then the fuse will eventually blow, and as the fuse is always rated to blow at a lower value than the cable current handling capability of the winding then the winding will never blow. That's the basic idea of the fuse. And a 200%+ potential overload until that happens? We are not talking about cable or insulation breakdown due to voltage which almost certainly will be fine we are talking about transformer windings and heat generation as the likely cause of failure. More power more heat what fails first? In this day and age tell me of a company who would make a consumer grade product with that sort of margin? Nup, just no. This is not powering a resistive load. I'd better expand upon that. We could cut the wire from the secondary to the board to open circuit the secondary and exactly the same thing would have occurred when Dave plugged it in. The power is going to be in the magnetisation current and the I2R of the primary winding - excluding eddy currents etc. If the current exceeds the rating of the current carry capability of the primary winding then a correctly sized fuse would interrupt the current before damage to the winding could occur. I don't know that much about transformers. What does actually hapen with increased voltage? Without a secondary load a perfect transformer doesn't take any power. I measuser my 230 V Ersa to have about 2H (measured at 100 Hz using DE-5000) and 42 ohm primary side. Simulating that (just an inductor) with LTSpice I got 5.7 W idle power at the transformer. I added a 1 ohm fuse. It took 135 mW. Doubling the voltage changed these values to 22.9 W and 540 mW. Since the fuse must be able to handle about 100 W, which equals to 0.43 A and 430 mW at 1 ohm, it wouldn't cut the circuit at 540 mW, but the transformer can probably handle 23 W.
If the inductor is no longer 2H at the increased voltage, it's a different story. Decreasing it to just 1H increases the power at the inductor to 91 W and power at the fuse to 2.1 W, which would probably blow the fuse. What would happen, if somebody applied DC? At least 100 W could be put to the transformer causing it to overheat before the fuse blows. Put in a thermal fuse in the transformer and achieve the same end with out burning down the owners home/work. Would it respond fast enough? Dave said this went up in seconds. So you have no problem with a fuse rated at twice the current rating on a transformer wound for 60hz and 110V being put on 240V? That is not Engineering by any stretch. With say 1 sq mm mains cable should take 10A your 110V fuse on a 60W iron is going to be 0.75 or 1A sure the cable is safe but are the windings? In the case of it having a 1A fitted your well over 200% and more like 300% power at the windings before the fuse goes. The current rating of the fuse should match the current rating of the wire in the transformer. Voltage doesn't enter into it. So, TL;DR: Weller US branch moved operations to Mexico, probably laid off all US engineering staff. Weller German offices probably existed prior to this move and continued to exist to be able to sell Weller products to the European market. Their offices there designed new units for the European market, and those were ported to the US market slowly. Eventually someone high up decided to hand the reigns of the US Weller branch more or less fully over to the German branch. Weller was founded in 1959 in Besigheim, Germany. It never was only an "office". Weller soldering tools were developed and (at least for the european market) manufactured in Besigheim, Germany until 2016, when manufacturing was moved to Mexico and 130 people were laid off. Weller claim that they still develop the soldering tools in Besigheim, Germany. BTW: my 2014 Weller PU81 was made in Germany and has a 500mA slow blow primary fuse which is user-accessible. I bought another one last year, which was "Made in Mexico". Seems like a very deliberate choice. Definitely not an "oversight", they chose to leave it out. Weller seeming a reputable company, their reply is not just hilarious, this is also very disappointing. We can understand they probably got trapped because giving a technical explanation would have led to potential backfiring. They certainly know they are (at the very least) borderline on this, and as long as they don't get sued, they will probably opt for polite silence, as they just did, instead of trying to justify themselves. Agree on this being deliberate, but they are probably saving more than ten cents. As their secondary protections are hand-mounted, "flying" stuff, they chose not to put those on a PCB with better mounting. I have a WES81 230V version and it has a IEC power connector with integrated fuse. So do they only use a primary fuse on the 80 watt model and not on the 50W? Or do they only use a fuse on the 230V model and not on the 110V? Is it only fused for the EU market? My pace wjs 100 has one of those as well as a long good quality mains cable. Just to the pace also came with a European mains cable which I put a uk plug on. Obviously you can find much cheaper IEC receptacles but they could cause other safety and reliability issues. Sorry, I did not mean to insult Weller's presence in Germany as being in some way inferior to the US-based Weller offices. This is obviously not the case when you look at the significant degree of sophistication of the German-designed units produced in the past 15 years over the state of Weller's product line from ~2000. That is saddening information about the lay-off. In the soldering industry, the name Weller® carries a lot of weight. 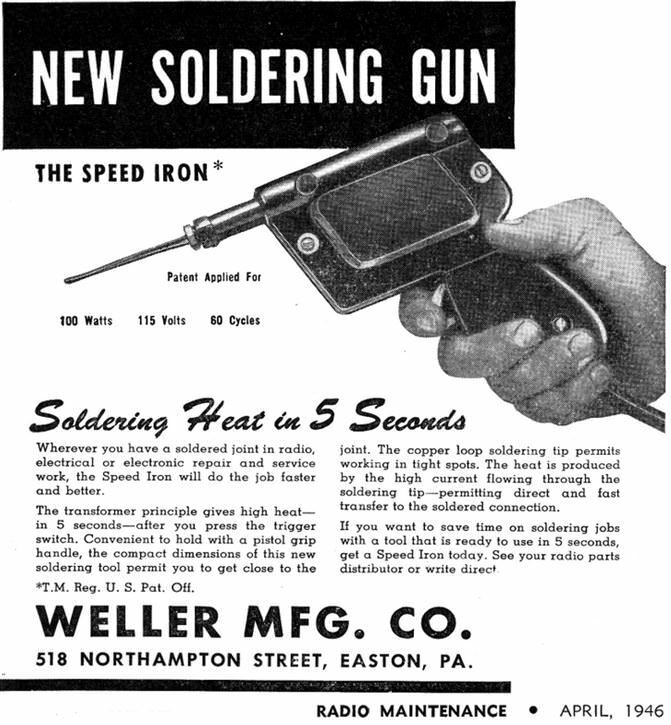 Carl Weller patented the first hand-soldering tool to heat and cool rapidly in 1941. Weller Manufacturing Company was founded in 1945 as a family partnership near Philadelphia, Pennsylvania, USA. Somewhere I have read (though I don't have time to find it now--perhaps later today) that Weller began operations in Germany because it was too difficult for the US offices to alter their products to European electrical safety specs from afar. 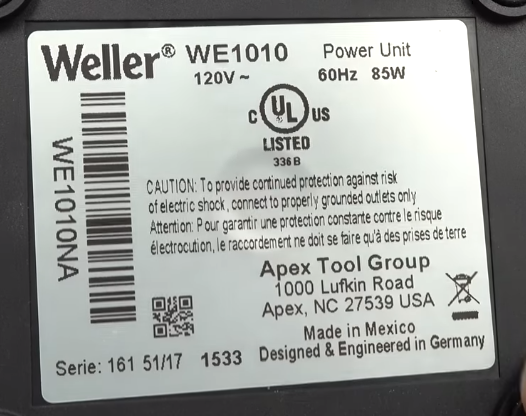 Going back to my earlier theories about design moving from Weller NA to Weller Germany, just look at the label on this unit... "Designed & Engineered in Germany" then "Made in Mexico." Keep in mind that this is the NA-variant. What I would really like to know is, are the units which are intended for the European market, like the rest of the European Wellers, made in Germany. If this is the case, I wonder if there are differences in the design. My thought is that perhaps Weller in Germany designed the European version of this unit, then it was "ported" to the US market. And, who might have done that "port?" I wouldn't be surprised if that was a task given to Weller NA who, being apparently now a shell of a company, went the route that they did (i.e., no primary side fuse) without running that past the original designers in Germany. So, my question would be, (a) where are the 230V units made and (b) do they have better protection? I believe Qualtek is an American company, are they rubbish? Such as? I don't recall one of those sockets ever failing. Transformers can be designed to be "fusible" so no primary side fuse is required for safety and I assume that was the case here. It is cheap but arguably safe since it is tested under adverse conditions. Do their older low voltage soldering irons have primary side fuses? I do not remember. I always assumed that Weller was in the typical position (like Fluke and Tektronix) of having been purchased to extract the value of their name and reputation with declining quality and value of their capitol with debt. For Weller this showed up in design changes to their products years ago and a marked decrease in quality. Even if a response from Engineering was drafted and passed to Corporate Communications for review, I can easily imagine they would not understand what the engineers said and would toss it out of fear and ignorance. Over the years, I have heard the "facts of life" that at some point, I will have to leave my field (software) and go into management. I did not really like that. I LIKE programming! Can't a good worker stay in his field forever? I think this is a good reason why the skilled workers SHOULD be promoted into management positions. When I was reading the comments about fuse size for 120v versus 240v, my first thought was: Why not select a MOV suitable for 120v and put that behind the fuse? Wouldn't that buy enough time to blow the fuse before the transformer smoked? I am not a transformer guy, but my second thought was: Wouldn't the transformer saturate (with 240v), and blow the fuse quickly? Turns out, you cannot replace a primary side fuse with some printing on the label. Was never too impressed with Weller. Seem poorly built and not very powerful. "The WE 1010NA is UL and cUL approved and fulfill the UL standards according “UL 499- Standard for Safety Electric Heating Appliances”. That is and was the base to release this product for sales in NA (USA and Canada). The WE 1010(230V) for the European market is manufactured according the CE directive and fulfill the safety Standard according DIN EN 60335-1 and DIN EN 600335-2-45. " UL 499 is an antique safety standard from an era where soldering irons were just a power cord and a handle with heater. Older versions of the standard relied on the mains breaker for protection against mains faults. But here we have a power transformer (component) which can fail partial shorts (shorted turn on primary or secondary) which is not a dead short but rather a fire hazard as the transformer draws high current and heats up. There are ways to heat up a transformer to burn up and catch fire. This failure mode a certifier will assess by overloading or shorting the transformer secondary, to see if that component failing makes a hazard. Your home stereo, wall warts, clock radio etc. consumer electronics all require a primary fuse of some sort in the power transformer. Seeing that fuse on Hakko and other Weller products, Metcal etc. is common sense - but too bad the politics of a fuse are at play. CE is only declaration of conformity. You (or a notified body in some case) declares that it confirms the law. "Approval" means (for example) that the product got checked that it can be placed on the market. Two very different thing, with different liability and different procedures.